Mold becomes a problem inside a home or business when there's a lot of humidity or any kind of moisture for a long period of time. The problem can start with something like a broken pipe or large spill that goes untreated, or from a leaking roof or plumbing. 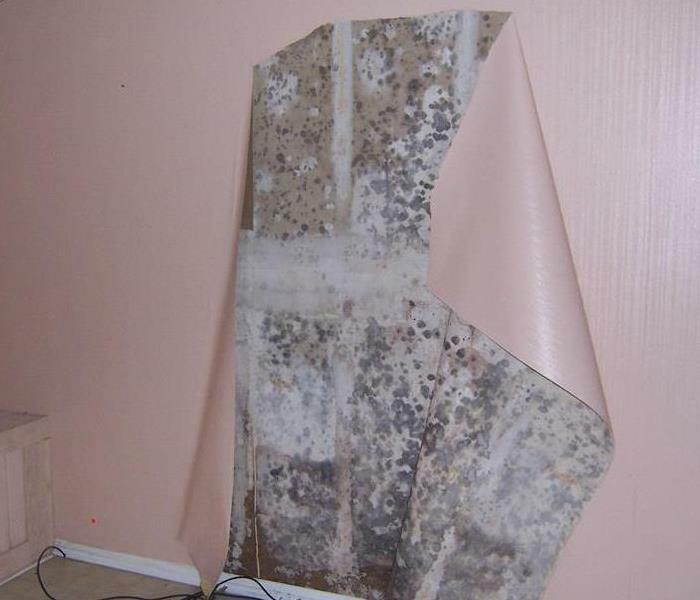 Even high humidity or warm, moist air condensing on cool surfaces can trigger mold problems. 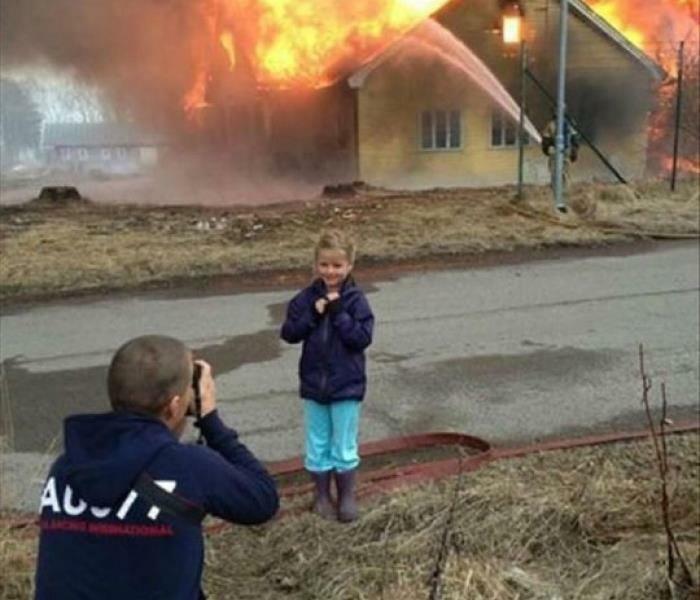 When you have a fire in your home it is very important to start the clean up fast. The longer you wait to start the clean up the more excessive the damage can be and that will also lead to it being more costly. SERVPRO of Western O'Fallon / Wentzville will work with all insurance agents. It is best to get us on the job site as soon as possible. We are available 24/7. The smoke and soot is not always visible. Our trained professionals know exactly how to get all of the hidden smells that may linger in your home if it goes untreated. Every item in the home will need to be wiped down. Soap and water might work but it is best if done with what is called a dry sponge. We will take an inventory that is writen and with photos of all items. We will clean what we can on site and what needs to be removed during the clean up and renovation we will bring back to our shop to clean. We also have equipment that will actually disintegrate the smoke leaving your home smelling better than before the fire when we are done and this is a permanent fix. Unlike simply resealing the walls and painting and getting new flooring. Every morning at SERVPRO of Western O'Fallon / Wentzville we have a team meeting that includes all of the field technicians, repair professionals and office personnel. Greg Young, one of our owners, conveys to everyone that you cant just say you are the fastest and the best. You have to go out there and be the fastest and the best. We believe that offering the best customer service and expert advice as fast as possible is important. Our people all train daily on providing the highest level of customer service, communication and consultation skills to each customer no matter the size or nature of the job. I have lived in Wentzville my whole life and every year like clockwork spring hits and I do not want to be inside cleaning. However it always feels so good to have the whole house clean from top to bottom windows and all. Much like our home our businesses need to have a deep clean once a year also. Schools are a big one. Every year at the end of the school year they have to get in there and clean and disinfect the whole place so when the kids come in for the next school year there is no trace of last years winter flu hanging around. This does not just apply to schools all business need a good cleaning and disinfecting at least once a year. It is a proven fact that clean businesses are more profitable. SERVPRO of Western O'Fallon / Wentzville has the professionals and the equipment that can do that in a more cost effective manner. Call us today for a quote on having your business cleaned. Or your home! When disaster hits you want to call someone that you know you can count on and that you trust. SERVPRO of Western O'Fallon / Wentzville is that person. We have a 5 star rating on Facebook, Google and Yelp. Our testimonials from past customers says it all. We are a family owned business that hires based on customer service capability. Our workers are required to treat each job as if it were their grandmas house or business. They do an excellent job at that. Greg and Joanne Young, the owners, have customers that go out of their way to call them and brag on our tech crew. They want them to know how helpful, kind and polite they were through the whole process. We take great pride in what we do and it shows. Take a minute to put our phone number in your phone so that if you have it at your fingertips when you need it. File it under Help so it is easy to remember. That number is (636)856-9700. We will be there when you need us! When you are running a business and a catastrophe strikes you have got to get it cleaned up and get back up and running quickly. 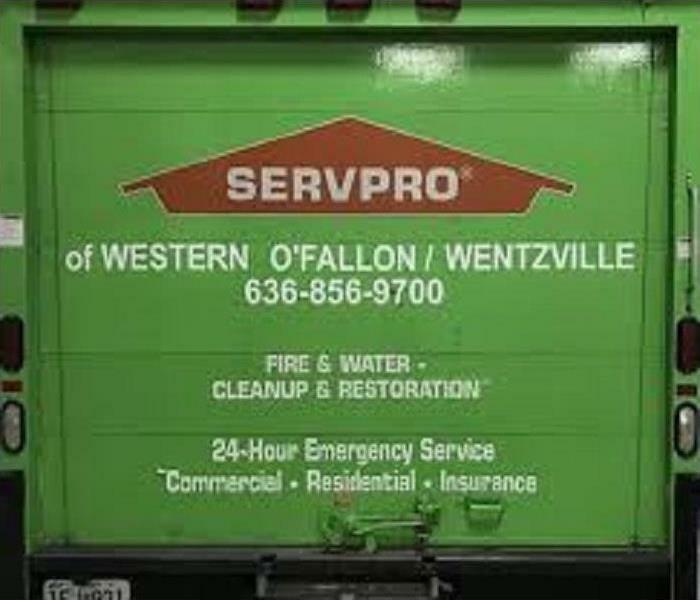 Did you know that SERVPRO of Western O’Fallon/ Wentzville is available 24 hours a day to do just that for you? We are experts in restoration services. We can handle just about anything you throw at us. We do fire restoration, mold restoration, Water restoration along with electronic restoration and document drying. We don’t just handle catastrophes. The cleanliness of your business speaks a lot about you. We do all types of cleaning from celling to floor. No job is to big or too small. 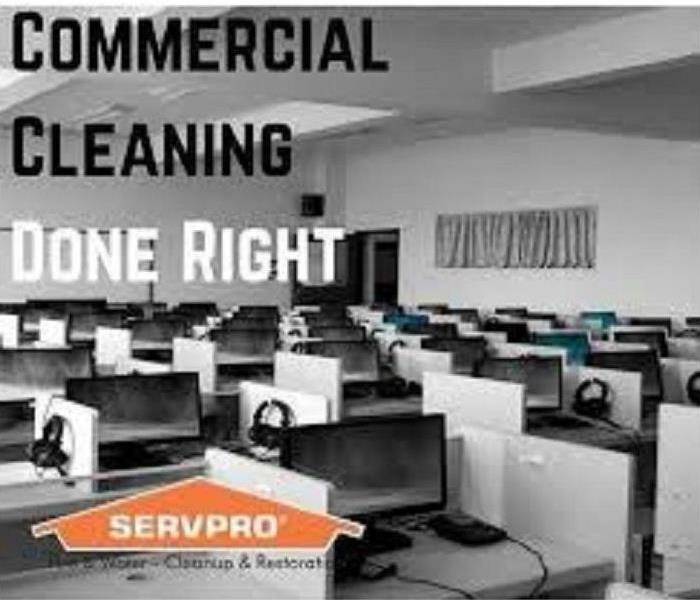 For all of your cleaning needs call SERVPRO of Western O’Fallon / Wentzville. Something that I think all of us can agree on living here in the Wentzville, O'Fallon area is that if you don't like the weather today wait a few hours it could change. We had a crazy cold and snowy winter. That caused a lot of broken pipes and flooded basements. We then went right into our wet rainy spring not to mention all of the snow melt from not just around here but also north of us, causing our sump pumps to work overtime and just not be able to get the job done so we have had a lot of flooded basements. 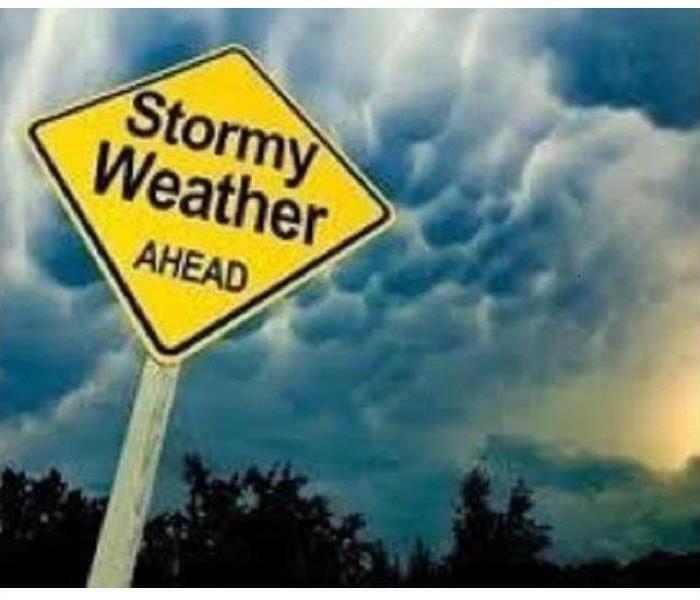 Spring and fall are both times that we have heavy winds causing roof damage resulting in wet attics. With our dry hot summers there is a big worry of fires. 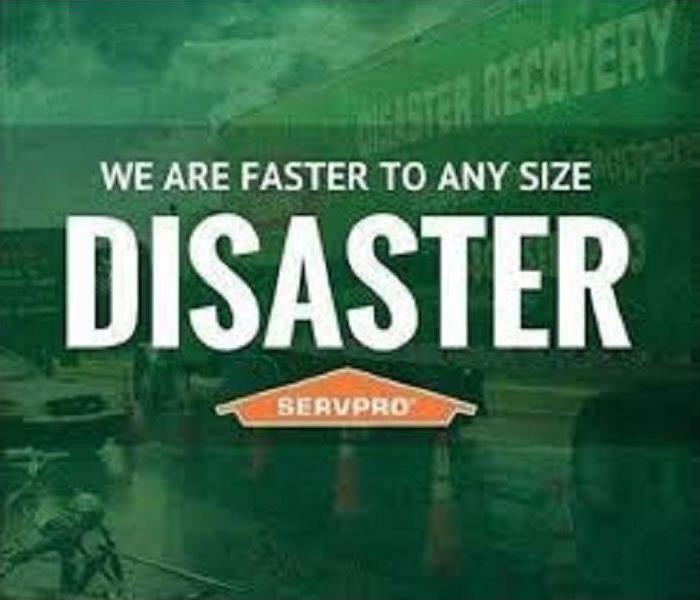 So here in Missouri no matter what the storm is SERVPRO of Western O'Fallon / Wentzville can make your home "Like it never even happened." We Are Your Go To Guy! Why SERVPRO of Western O’Fallon / Wentzville you might ask yourself. Well here are a few reasons. Are you a property manager? If so, did you know that we do move outs? That’s right! 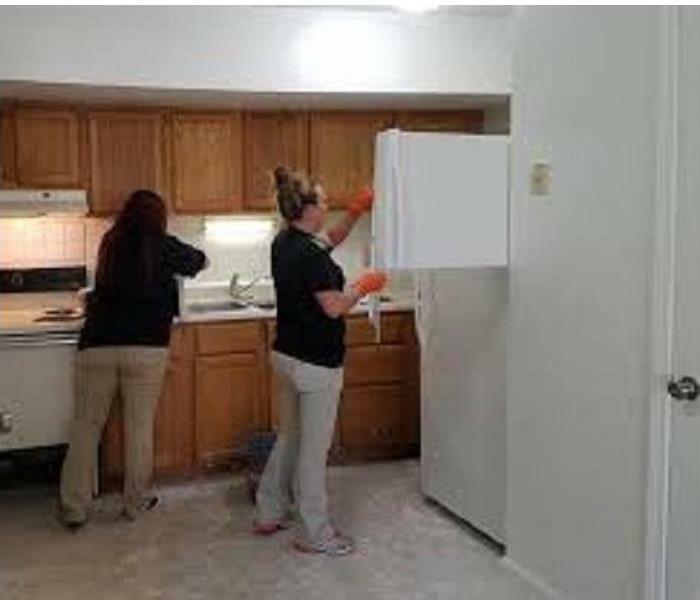 When you have a tenant move out and you are left with a nasty mess we will come in and deep clean the whole place giving you the time and freedom to do what you do best and that is, find new renters. Are you a home owner that is trying to sell your home, but you are having a hard time because your house smells like your dog? We can come in and clean your floors your airducts and do an ozone treatment to get rid of the smell of your dog for good. Are you a home owner that has quit smoking, but you can still smell it in your house? We have a way of getting rid of the smoke smell for good. Not just masking it with paint and smelling sprays. But for good. Are you an insurance agent who would love to have a company that you can send your clients to who you know will treat them like their own family member? Well look no further because we are well known for that kind of treatment. Are you the head maintenance person for an office building that had a sprinkler head get broke during construction and you need to get all the offices up and running like yesterday? We are also that guy. We are available 24/7 and can get to you within an hour if needed. So, you see no matter who you are or what your cleaning issue SERVPRO of Western O’Fallon / Wentzville is your answer. Why SERVPRO of Western O'Fallon/ Wentzville? Have you asked yourself the question Why SERVPRO? Well here it goes. SERVPRO of Western O’Fallon/ Wentzville is a family owned business. Greg and Joanne Young, the owners, decided in 2017 that they were going to leave the corporate world and create a work environment that not only them as the owners can be proud of but also employees. They have put their harts’, souls and life savings into this company. They do everything it takes to grow their business with word of mouth. They run their business by not asking their employees to do anything that they would not do themselves. And they expect nothing less but the best customer service from their employees. If you want to do business with the best than look no further than SERVPRO of Western O’Fallon / Wentzville. Call us for Carpet Cleaning, Tile and grout cleaning, air duct cleaning, Fire water and mold restoration, Commercial and residential. If you can’t or don’t want to clean it, we can! When a local business catches fire it leaves a big job behind. In an effort to get them up and going as soon as possible it was all hands on deck. 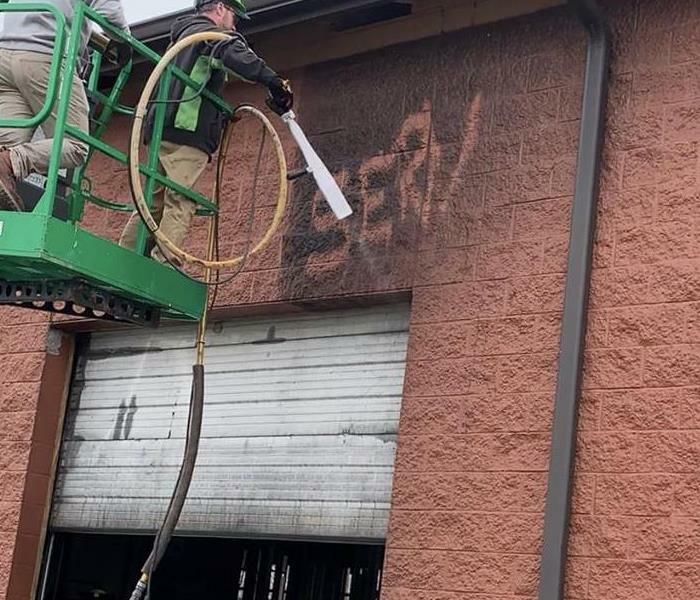 There were several different SERVPROs that jumped in and helped on this one. Our tech Mike used a Dry Ice Blasting machine to get the soot off of the inside and the outside of the building. By using a dry ice sandblaster he was able to get it all clean even better than it was and not have the mess of dirty soot water that you would have had if he would have used a power washer. 4/15/2019 - What Makes Us Different? 4/13/2019 - We Are The Best! 4/11/2019 - We Are Your Go To Guy! 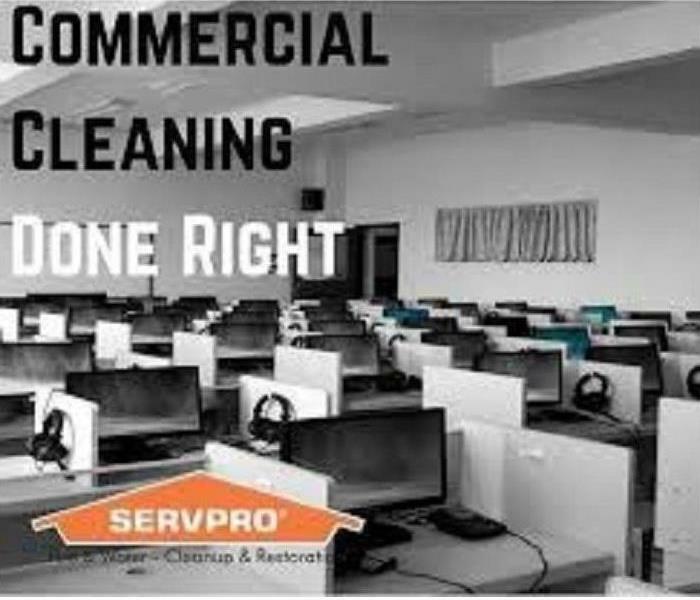 4/10/2019 - Why SERVPRO of Western O'Fallon/ Wentzville?